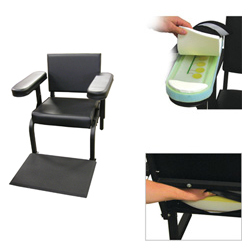 The subject's chair is built to orthopedic standards to ensure proper posture and back support. Adjustable armrests are a one-piece design making this section solid, requiring less hardware. This chair model comes covered completely in black naugahyde. This chair comes with seat, arm and feet activity sensors built into it and prewired! New design allows us to ship the chair unassembled via ground or air shipment instead of via truck in only two boxes. This will save you almost $100 in shipping charges and enable faster delivery. The chair comes with all the tools that are required and is easily assembled in a matter of a few minutes.